Rohtas Fort (Urdu: قلعہ روہتاسQila Rohtas) - a garrison fort built by the great Afghan king Sher Shah Suri. The fort measures approximately 4 km in circumference displaying the first example of the successful amalgamation of Pukhtun and Hindu architecture in the sub-continent. 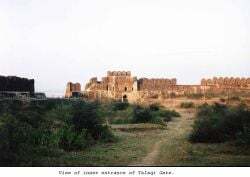 Sher Shah Suri named Qila Rohtas after the famous Rohtasgarh Fort in Shahabad district near Baharkunda, Bihar which he captured from the Raja of Rohtas Hari Krishan Rai in 1539. UNESCO designated Qila Rohtas a World Heritage Site in 1997. Rohtasgarh, situated on the upper course of the river Son, 20 37’ N and 85 33’E, was built by Harish Chandra of the Solar dynasty, named after his son Rohitasva after whom the fort (Rohtasgarh) was named. 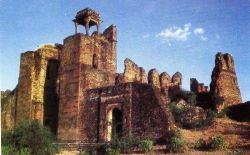 Sher Shah constructed Qila Rohtas to block Emperor Humayun's return to India after defeating him in the Battle of Kanauj. That fort lies on the old Grand Trunk Road road between the North (Afghanistan) to the Plains of Punjab. It blocked the way from Peshawar to Lahore. The Fort served to suppress the Gakhars of Potohar, allies of Humayun who refused to give their allegiance to Sher Shah Suri. The Gakhars made a feeble retort by building some fortifications near the village of Sultanpur, which still remain today. 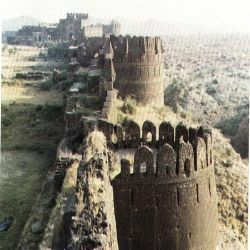 Qila Rohtas is situated in a gorge approximately 16 km NW of Jhelum and 7 km from Dina. Constructed on a hillock where the tiny Kahan river meets another rainy stream called Parnal Khas, turning east towards Tilla Jogian Range. The fort stands about 300 feet above its surroundings, 2660 feet (818 meters) above sea level and covers an area of 12.63 acres. The fort has 12 gates (four of which serve as trap gates), 68 bastions, 1900 battlements and 9500 stairs. Sher Shah ordered the construction of Qila Rohtas to block Emperor Humayun's return to India after the Battle of Kanauj. According to Tarikh-i-Daudi, the project cost 80,505,002 Dams (Bahlulis). Sher Shah Suri died before the completion of the magnificent structure. Ten years after Sher Shah’s death and the end of the Suri dynasty, Emperor Humayun returned to rule India for another 15 years. When Humayun returned, the Governor of Rohtas Tatar Khan Kasi fled. The fort had never been popular with the Mughals because of its military character. Emperor Akbar stayed there for a single night. Emperor Jahangir rested here for a single night while going to Kashmir for entertainment. He said the following about its location: "This fort was founded in a cleft and the strength of it cannot be imagined." Emperor Jahangir again stayed at the fort when forced to go to Kabul by Mahabat Khan. Nur Jahan, his beautiful and resourceful wife, obtained troops from Lahore and ordered Mahabat Khan to release her husband. Emperor Jahangir then proceeded to Rohtas and held his court there for a while. Then he went onto Kashmir and back to Lahore to die. The later Mughals seem to have made no use of the fort. Allies of the Gakhars, they consequently relied upon them rather than stationing troops to maintain their hold over the area. The Durranis Pukhtuns, enemies of the Gakhars, maintained their Governor in residence at the fort. They used the fort to keep communication with their capital Kabul open. After the takeover of the Punjab by the Ranjit Singh, Sardar General Gurmukh Singh Lamba captured the Rothas Fort from Ghakhar chief Nur Khan, father of Fazil Dad Khan in 1825. The Maharaja Ranjit Singh gave the fort to Sardar Mohar Singh. When Mohor Singh retired to Banaras, the fort and the contingent of seven hundred horses were placed under Sardar Gurmukh Singh Lamba. Raja Fazal Din Khan, who joined Sher Singh in rebellion, were the last people to manage Rohtas. Most of the fort remains in excellent preservation. 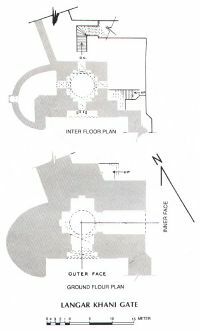 In Haveli Man Singh, portions that have fallen away, yet the original construction may be comprehended. The central archway of the Chandwali Gate has been rebuilt recently, constituting the only portion of the fort reconstructed from scratch. In early 2005, seepage, heavy rains, and general neglect caused the left inner face of the Talaqi Gate to collapse, and the right flank and foundation to become detached from the original structure. 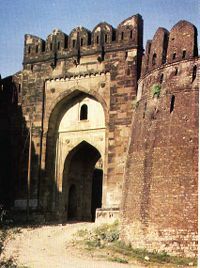 The Gatali Gate forms one of the original entrances to Rohtas. Over time, its right bastion and supporting wall have collapsed as a result of permeated rainwater and the erosion of its foundations. Qila Rohtas served as a garrison fort, able to support a force of 30,000 men. Due to its location, massive walls, trap gates and three Baolis (stepped wells), the fort could withstand a major siege although never tested. Most of the fort had been built with ashlar stones collected from its surrounding villages such as Village Tarraki. Some part of the fort had been constructed with bricks. The fort has an irregular shape, following the contours of the hill it sits on. The fort measures approximately 4 km in circumference; a 533 meter long wall divides the citadel (for the Chieftain) from other parts of the fort. The fortification has sixty-eight bastions (towers) at irregular intervals. One of the three Baolis sits in the citadel, the rest position in the other parts of the fort. 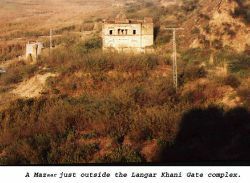 One of the Gates (Langar Khani) opens into the citadel, serving as a trap gate in the direct line of fire of the bastions. The Khwas Khani gate displays an example of double walling. A small enclave on the western side constitutes a citadel within a citadel. Accessible by only one gate, it had an excellent Baoli suggesting the private entrance for a chief and his family. In that citadel a beautiful Masque called the Shahi Mosque (Not to be confused with the one in Lahore) sits. The Fort lacks palaces except for a structure built by Raja Man Singh called the Haveli of Man Singh, built on the highest point of the citadel. The height of the outer wall varies between ten and eighteen meters, with its thickness varying between ten and thirteen meters. The wall has two or three terraces, varying in thickness to a maximum of thirteen meters near the Mori Gate. 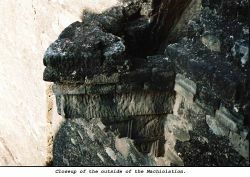 Staircases link the terraces, the topmost terrace hosting merlon-shaped battlements. Muskets fired from those battlements, soldiers poured molten lead over the walls as well. The wall had been built in sandstone laid in lime mortar mixed with brick. The gates had been constructed in grey ashlar masonry. Some portions have been built using burnt brick. 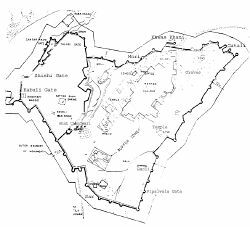 The Rohtas Fort has the following 12 gates, all built with ashlar (dressed and fitted) stone. 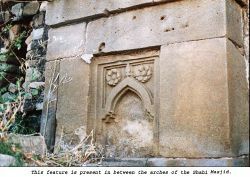 Sohail Gate provides the best example of masonry in use in the time of Sher Shah. It derived its name from a Saint named Sohail Bukhari, buried in the south-western bastion of the gate. 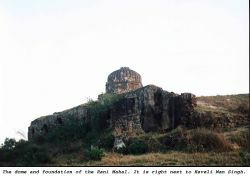 Another theory advances that the gate had been named after the Sohail Star which rises on that side of the fort. A double gate rectangular in shape, it measures 21.34 meters (70 feet) high, 20.73 meters (68 feet) wide and 15 meters (50 feet) deep. The central archway spans 4.72 meters (15 feet) wide. It has an inner and an outer arch decorated with beautiful and simple motifs of sunflower, the decoration repeated in other parts of the Qila. 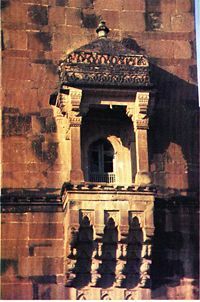 Balconies stand on either side of the central arch, having a small dome, their sides and bottom decorated. Unlike other parts of the Qila, which had been built in Afghan-Persian style, the balcony presents example of Hindu architecture. Haveli Man Singh has balconies of the same design. A small window exists in the middle of the outer arch, different from those on the two balconies to either side of the outer arch. The balcony has a much simpler design than the other two balconies. Seven merlons grace this gate. The bastions, with battlements with loopholes, have three levels on the inside. The inner side of the gate mirrors the outside but has less decoration. No battlements exist towards the inside and no balconies either. The rooms in the upper story of the gate have windows that open towards the inside of the Qila. Like the outer arch, a small window sits in the middle of the inner arch. The gate now houses a Visitors information center and a Museum set up by the Himalayan Wildlife Foundation. The Shah Chandwali Gate, named after a Saint Shah Chandwali who refused to get his wages for working on this gate, links the citadel to the main fort. The saint died while working, and had been buried near the gate. His shrine still stands to this day. This is a double gate, with an outer and an inner door. The outer gate, the entrance which opens from the citadel, measures 13.3 meters wide and 8.23 meters deep. The inner gate, a simple archway, measures 3.66 meters wide. The Kabuli Gate, named “Kabuli” because it faces Kabul, opens to the west. This is another double gate, its opening measures 3.15 meters (10 feet) wide. It has two bastions on each side. The gate has five battlements on top and stairs leading up to it from the outside. On the southern side of the gate, the Shahi (Royal) Mosque stands which led to the popular name Shahi (Royal) Darwaza (Gate or Door). A Baoli sits near the gate. The Shishi Gate derives its name from the beautiful glazed tiles used to decorate its outer arch. Those blue tiles represent the earliest examples of the technique, later refined in Lahore. The Hijri year 948 equals 1541 C.E. 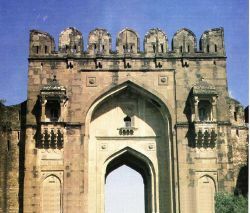 Langar Khani Gate, a double gate, measures 15.25 meters (50 feet) high, 3.5 meters (11.5 feet) wide with a central arched opening. The outer arch has a small window like the Sohail Gate. The outer opening leads to a Langar Khana (Mess hall or Canteen). Two bastions stand on either side of the gate housing a kitchen, stores and a well for water. The Gate has an L shaped opening; as soon as one enters from the outer gate, one has to turn right. The Mori or Kashmiri Gate opens to the north, facing Kashmir, hence its name. This gate opens into one chamber which opens into another. The Khwas Khani Gate had been named after one of Sher Shah Suri’s greatest generals, Khwas Khan. The original entrance to the Qila (Fort), the gate opens to the old Grand Trunk Road Road. A double gate, with outer and inner doors; the outer gate measures 12.8 meters wide (42 feet) and 8 meters (26 feet) deep, with a bastion and a defensive wall on each side. On the bastions, canons could be deployed. The inner and outer gates almost mirror each other exactly. The top of the gate has five battlements, with loopholes as well as machicolation. Unlike other gates of Qila, the inner side of the gate has five battlements. The inner and outer arches have sunflower motifs like the Sohail Gate. The gate also has a room with windows opening to the inside and the outside. When the Gakhars refused their allegiance to Sher Shah Suri, he launched an expedition to punish them. That resulted in the capture of the Gakhar chief Sarang Khan and his daughter. Sher Shah Suri killed Sarang Khan; he married Sarang's daughter to his favorite general, Khwas Khan. 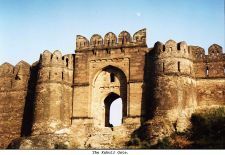 The Gatali Gate, a single gate 9.15 meter high and 6.1 meter deep, faces toward the village Gatali Ford(ravine), also Patan Gatiali or Gatiyalian, the important point to cross the River Jhelum for the Kashmir Valley, thus the name. Tulla Mori Gate serves more as an entrance than a gate. On the eastern side of the fort, it measures two meters wide with a bastion next to the entrance. Pipalwala Gate, a small entrance like the Tulla Mori Gate, measures 2.13 meters wide. Sar Gate, called “Sar” because “Sar” means water, constitutes a small entrance with a bastion and a Baoli next to it. The Shahi Mosque, a small mosque with a prayer chamber and a small courtyard, sits near the Kabuli gate. The most decorated of the original buildings of the fort, stairs lead directly from the courtyard to the top of Kabuli Gate in case of attack. The prayer chamber measures 19.2 meter long and 7.3 meter deep, divided into three equal chambers. Domes grace the inside, but from the outside no domes can be seen. A small room for the Pesh Imam (Prayer Leader) sits at the end of these three chambers, with a small domed roof from the inside but no outer dome. No place for ablution (cleaning up before prayers) in the mosque exists. Built into the fortification wall, i.e., soldiers walked over the mosque's roof; the outer wall of the mosque serves as the fortification wall itself. On the outer wall of the mosque there are beautiful round designs with Islamic verses written in Naqsh script. A lily going around the Naqsh script surround those verses. Mughals used the lily design later in Tomb of Jahangir, Tomb of Nur Jehan and the Shah Burj Gate in Lahore Fort. The design seems to have been copied from the coins used in that time. The Main Baoli is located in the middle of the fort to provide water for soldiers, elephants, and horses, with 148 steps, each step measuring 20 cm (8 inches) wide. The upper portion has been cut in stone. It has three arches that span the length of the Baoli. The Shahi Baoli is situated near the Kabuli Gate to provide fresh water for the Royal family, with 60 steps that lead into the water. The Royal family used the small chambers for baths. Sar Gate Baoli is a small Baoli well near the Sar Gate, most likely used by soldiers. Raja Man Singh I of Amber, general of Akbar, built the structure sometime between 1550 and 1614. A two-story building constructed with bricks and plastered neatly, the structure architecturally bears no resemblance to the Qila Rohtas. A part of the structure has collapsed. There seems originally to have been four rooms of which only one exists now. The existing room measures 5.5 meters square, with balconies on the outside of it. Those balconies look similar to the one outside Sohail Gate. The whole fort can be seen from those balconies. Unlike Qila Rohtas, an example of Afghan architecture, Haveli Man Singh provided an example of unadulterated Hindu architecture. The Rani Mahal (Queens palace) is near Haveli Man Singh. It is a one storey structure. It originally had four rooms but only room remains standing today. The foundation of the four rooms can still be seen today. It is not an original part of the fort and is an example of Hindu architecture and built around the same time as the Haveli Man Singh. The room still standing today is about 20 feet high and beautifully decorated on the inside and outside. The roof of the dome like room is like a flower. The inside of the roof is decorated with flowers, geometrical patterns and faux windows. The room is about 8 feet by 8 feet. Rohtas fort had been built in the Afghan-Persian architectural style. Afghans and Persians Kings had been coming to the Indian subcontinent for at least five centuries before the construction of this fort. Before the construction of Rohtas, the combination of styles had been unharmonious. Qila Rohtas displays the earliest example of the successful mixing of those two styles, with the Afghan style being more prominent. Decorations on Shahi Mosque derived from Hindu architecture. Use of stone instead of bricks in building wall. Rohtas fort provides an example of purely “masculine” architecture, placing function over form; the fort lacks buildings for living. Even Kings had to live in tents when they came here. Stone carvings. Carvings grace the gates and in the mosques. Most of those engravings consist of Arabic script and sunflowers. Inside the Shahi Mosque just outside the Pesh Imam's (Prayer leaders) room, the word "Allah" (God) is written in Arabic, also on merlons on top of Shahi Mosque. The sunflower motif exists on each side of the arches of Shahi Mosque, also present in the guard post in between each gate. Calligraphic inscriptions. Most of those inscriptions have been etched in the Shahi Mosque. On the outer wall of the mosque the “Kalima” has been written in beautiful calligraphy in Naskhon both sides of each arch of the Shahi Mosque. An inscription in Persian on the Shishi gate gives the date of start of construction. The same inscription exists over the Talaqi gate, while other inscriptions grace the Khwas Khani, Langar Khani and Gatali gate. Glazed tiles. Glazed tiles had been used on Shishi gate, becoming immensely popular with the Mughals who further refined them. The tiles on Shishi gate, made in Lahore, represent the earliest example of the usage. Plaster. 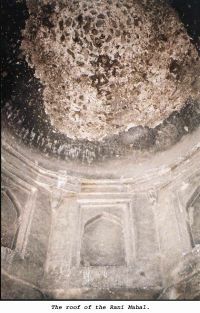 Plaster has been used in the Shahi Mosque. Machiolations. Machiolations, small drains that lead from the inside to the walls outside, have been built into the walls for use by the soldiers on the inside to pour molten lead or other hot liquids on enemy soldiers trying to scale the walls. The Rohtas fort has hundreds of them, each one beautifully decorated with geometric patterns. The Himalayan Wildlife Foundation conceived the Rohtas Fort Conservation Program in 2000 to help protect the sixteenth-century Rohtas Fort near Jhelum, working develop it to a World Heritage Site. The following projects have been undertaken by the Himalayan Wildlife Foundation in conjunction with the Royal Norwegian Embassy. Outside the Langar Khani Gate sits the tomb of Khair Un Nisa. She had been the daughter of the food minister named Qadir Bukhsh. She died here, buried in the tomb but she later moved to Sasaram. Until the construction of the new Grand Trunk Road, Rohtas served as a halting place on the main Peshawar-Lahore road. The road, in a fair state of preservation, had serais about a mile apart, one about one mile north of the Rohtas Fort. Matta, Basheer Ahmad Khan. Sher Shah Suri: A Fresh Perspective. Karachi: Oxford University Press, ISBN 019597882X. Nadiem, Ihsan H. Rohtas: Formidable Fort of Sher Shah. Lahore: Sang-e-Meel Publications, ISBN 9693506030. Rohtas Fort Pakistan Tours Guide. Retrieved June 28, 2016. Pakistan: Rohtas Fort World Archaeology Issue 17, May 7, 2006. Retrieved June 28, 2016. All links retrieved June 28, 2016. UNESCO World Heritage Center Web page: It has a panograph of the Qila Rohtas. This page was last modified on 29 June 2016, at 18:41.